So here, I am once again writing a vaguely relevant blog post, frantically trying to give the impression that I haven't given up. Its not that I've forgotten about this or been inactive, I've had things ready to post for a while but hey, December is a busy month you know? There's that Christmas thing, and the New Year thing, I spent some time finishing up building an arcade cabinet for myself and everyone is playing Star Wars: The Old Republic in their free time. But I digress, I'm here again, and though the update may be small - it is arguably less trivial than most past updates. Albiet barely. Obviously an important aspect of graphical adventure games is that need for ... graphicals. To aid my own thought processes, and to better plan out puzzles and the like, I decided the best thing to do would be to crudely sketch out the one room I require. So I did. And then I realised I had no scanner, which was part of the reason I never got around to posting it, but then I borrowed one so problem solved. See, real life is like an adventure game too! 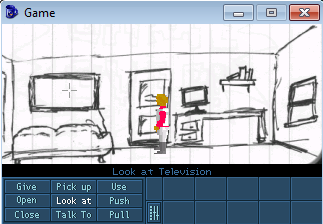 As you can all plainly see, there is a chair, a couch, a window, a big TV, a door, a wall safe... all totally normal room type things that were not at all hand selected to suit certain puzzles and aspects of the game. The end product will be more colourful and pixely, but will likely retain a similar design and placement of the objects within the room. Anyway, we should do this again some time, definitely sooner than last time. I super secret swear it.